As a Biotech or Life Science business, you may have actioned an element of Search Engine Optimisation (SEO) on your website's pages, and you could be finding it difficult to correlate results and see the revenue-driving potential. You may even consider SEO to be an unimportant area for your sector and not particularly exciting or engaging, and it is certainly a strange and ever-changing subject to try to tackle in one article. However, I am going to bust some myths and set some expectations so you can be empowered to take advantage of this area of your Biotech and Life Science digital marketing. It is an advantage to gain an overview of the power of SEO and how to get the best from it for your Biotech and Life Science business. A greater understanding of Search Optimisation will guide you where best to place your efforts and spend your time, or equally guide you to be a more informed purchaser of SEO services. Why does SEO matter to business in the Biotech and Life Science Sectors? What’s the point in having a comprehensive website if the right people can't find it? Your website is your bit of the Internet, your hub; you own and control it, and you own your content. The other platforms are out of your control (social media, blogger platforms) and you don’t necessarily own that content. Your website is your number one promotional space online. You need your multiple audiences to come back to your website and see the range of products or services you offer, why you are different and the value you present. I’m not going to pretend SEO is easy. There are no quick fixes or shortcuts, and anyone that tells you that there are is probably worth avoiding. However, when done correctly, it is outstandingly powerful for small business. Are you in need a rapid Internet presence? Then paid search is for you – via Google Adwords or Facebook Ads. SEO is not paid search; SEO is the organic/natural listings underneath the ads. SEO is a defined and specific process which pays off massively in the long term, filling your marketing funnel for years to come and providing you traffic that converts. When your audience is looking to find answers to their problems, research products and services, the most likely first place to go is Google. Google’s share of the search market is currently around 70%, making it the main area to focus your efforts. Keep in mind that a solid keyword strategy is invaluable when used across both search and social media. When thinking of Social Media Marketing, it is typically the place your audience will go to gain peer reviews, insight and knowledge. However, Google is still the leader and has the best conversion rates (conversion rates - definition – turning visitors into customers). Our clients know that the SEO strategies we implement consistently provide the biggest impact on their lead generation (lead generation – definition - qualified enquiries or list building for sales leads) and ROI (ROI – definition – Return on Investment, a monetary return which is more than the cost). As creative web professionals, we have gained an in-depth understanding of what works and more importantly what doesn’t, and can show you specific examples of how and why SEO is so powerful. We work closely and long-term with our clients, consistently helping them to rank highly for competitive phrases in the Biotech sectors that convert into new leads and new business. The process of website SEO isn’t fast and easy, however, when created and implemented correctly and given the right investment in time, it will drive your business. When your audiences are looking to research your products and services the first place they go to is Google. Google’s share of the search market is currently around 70%, making it the main area to focus your efforts. Keep in mind that a solid keyword strategy is invaluable when used across both search and social media. When thinking of Social Media Marketing, it is typically the place your audience will go to gain peer reviews, insight and knowledge. However, Google is still the leader and has the best conversion rates (conversion rates - definition – turning visitors into customers). 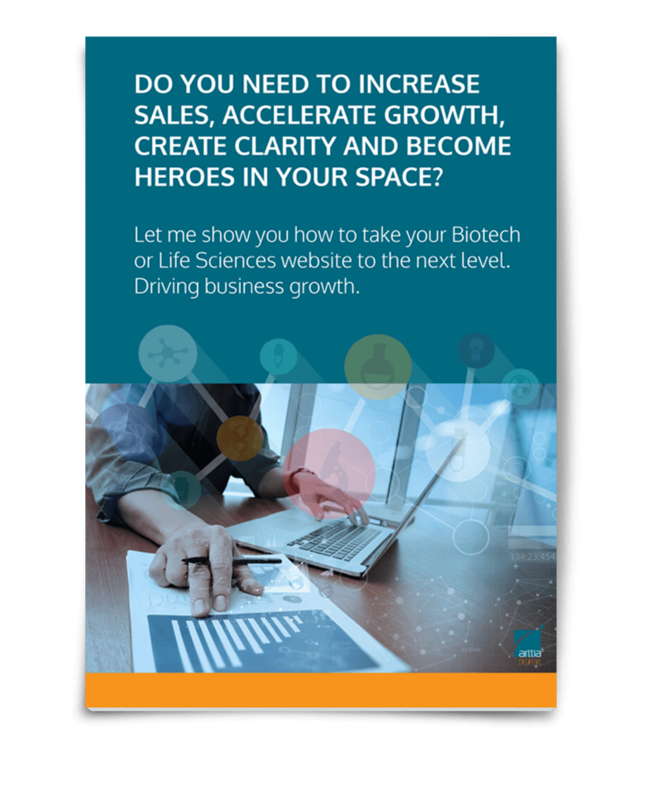 There are 4 key areas to focus on when considering SEO for the Biotech and Life Science sectors. Let’s face it; there’s no getting away from the fact that websites are technical. The way your website is built; its structure, platform and the way it is coded, all have an impact on how Google ‘sees’ your website. A well-coded website is a crucial foundation for SEO results. Google wants their searchers to click a link and have a positive user experience. That is one of the reasons that WordPress has become such a popular platform on which to build websites; its code is well put together and is constantly being improved. Some platforms are said to be less search friendly and flexible for SEO strategies. Speak to us about the technical set up of your website and any SEO provision. You don’t need to know the exact code base. We can run a comprehensive technical and SEO audit of your website to see where you are now, what improvements need to be made and probably some easy wins! REQUEST A WEBSITE SEARCH ENGINE OPTIMISATION REVIEW . Includes - Detailed Seo Review. Plus 2 Hours SEO Consultancy and Training For You And Your Team. We understand that the Biotech sectors have multiple audiences. To have an effective SEO strategy, you need to know each of your audiences in detail. Knowing what your users are looking for, why they should choose you, your benefits them. What problems do they have that you solve for them better than anyone else? You need to research their needs and how you fit with their needs. Research like this takes time and is invaluable. Your customers will have different needs at each stage of their buying process, requiring a slightly different set of keywords for each stage. This SEO research is worth spending considerable time on. Having in-depth conversations with your audience and finding their pain points. It’s time to get smart with your data! Create a document/spreadsheet and write out all the search terms and problems your audience is likely to have. This will guide your content development and creation. Helping you to have a better content strategy. You have less than a few seconds to grab your visitor’s attention. They need to quickly understand who you are, what you do and how you solve their problem. Attention to detail is critical for content and User Experience. The content of your website includes; User Experience, User Engagement, Creative Design and without a doubt your copy, images and graphics. All of these aspects need to work in harmony to build your brand and showcase your expertise. Both Google and your visitors don’t like or benefit from ‘thin content’ (definition –pages that add little or no value to the reader) or a difficult to use website with poor UX. Google tracks ‘bounce rate’ (definition - when people leave your website without additional interaction) and if your bounce rate is high, that’s an area that you urgently need to address. All of your content must be outstanding, well written with unique images that support both your brand and your messages. This all adds to your Users’ Experience and builds your brand. Long, detailed posts (skyscraper technique – definition- repurposing popular content, providing high value to the reader) are consistently found to rank higher in search than ‘thin content’. Spend time creating extremely useful in-depth posts, fresh content on your website shows visitors you care and that you provide them with the latest advice and insight they need. Let's face it; mediocre content can harm your brand. If your website traffic is low, bounce rates high or you're just not getting the shares or likes on social media you'd like, then perhaps your content doesn't match what your customers are looking for. Your website and blog content need to be outstanding and way, way better than your competitors. Again, what’s the point in having a comprehensive website if the right people can't find it? What’s the point of creating new content if no one knows it’s there? This is where promotion matters and why content marketing matters. Tell the world why you’re different and how you solve their problems. Social media is a hungry place and having new content to promote and drive traffic stops you repeating the same messages. Traffic and interactions are a factor for SEO. Your domain and page rankings are an SEO factor. Your social interactions are an SEO factor. Your online visibility is an SEO factor. All of these have an impact on your search page results. Remember to go where your audience goes online - what social channel are they on? What forums and groups are they frequenting? Track all of your promotional activity. Fine-tune and adjust. We know that no two Biotech businesses are the same, so no two SEO strategies are the same. You’ve created new content, whether it is a blog post, a case study or industry insight. You promote it on social media. Great. However this is just the start. You need to promote it again and again. Track content that gets the most interest and replicate it. Rinse and repeat. Promotion isn’t just via social media (paid or natural) it can be via your newsletter and face-to-face networking. Here are a few common questions and misconceptions I hear from the Biotech and Life Science sectors. Hopefully, my answers will help set your expectations when considering SEO as part of your marketing. Q. Can you get me on page one of Google this week? A. Yes if you pay for Google AdWords and have a good budget. Not via SEO. If anyone says they can with SEO, they are worth avoiding. Paid traffic can compliment your SEO strategy. However, no matter what route you take, any form of digital marketing takes effort and time and SEO is no exception. The length of time your site has been around is a factor. If your competitors have a website that has been live for many years they will have an advantage over a site that is new. Google looks at factors such as domain age, domain renewal and depth of site content, the amount of links and interactions and ranks pages based on this information. A. It takes Google at least 2-3 weeks to start to ‘understand’ any new content, including new websites and blog posts. It takes time for your new content to gain interactions, links and traffic, so you have to factor in this time scale when monitoring results. Q. What are meta tags? A. No! People say this because it’s hard work and they tend to go for PPC (pay-per-click), for short-term value instead of SEO, which delivers long-term value. Google cites around 200 factors that guide it when presenting search results; some of these factors have more of a ‘weighting’ than others and need to be considered for SEO impact. Knowing where best to place your efforts is key. Q. I’ve got the Yoast (WordPress SEO) plugin on my website, so is my SEO covered? Start with the basics. Make sure your website is linked to Google Analytics and the Google Search Console. On Google Search Console make sure you have connected and verified your site. With this confirmed you need to check for any website issues flagged and fix them. Then take a look at your Search Traffic and your Search Analytics - queries, rankings, click-through-rates and impressions, top pages and inbound links. This is invaluable data to get you started. Look for any disparity with the data. Not the right traffic? You might have a bigger problem and need to review your content. FREE 30 minute website SEO session. SEO takes time, lots of it. Your time, your team’s time or an SEO specialists time. There are no shortcuts. Effort is required with set up, creation and promotion, then with continual monitoring, fine tuning, adjustments and changes. Results typically take time; this can be up to 6 months, but it is so worth it! Focus your efforts on becoming a trusted authority. Your content should solve their problems and speak to them as early as possible in their journey. This article really does just provide a short, yet actionable overview of SEO for small businesses. If you are still finding it somewhat confusing then you probably will need to find an SEO expert or continue to educate yourself, read up and research online. Please note – SEO is still a relatively new activity and is constantly evolving, as is most of the web. My insight and strategies here are correct at the time of writing. Not having a crystal ball or being able to see into the future I can’t predict what the SEO landscape will look like in even 6-12 months. However, this article is based on hands-on, day-to-day crafting and working with website design, creative content and SEO. I continuously monitor and split test all the latest SEO changes, so you don’t have to.